PS. Your system stopped the sensitivity at the grooves at the top of tooth enamel (which I had thought were caused by the sharp instruments digging too deeply to remove calculus from some of my teeth). However, the sensitivity returned after I began to eat a particular mildly tart kind of apple that is a hybrid of the Delicious and those green tart ones. I guess the apples you refer to in the book are not tart? I won’t buy those anymore until complete healing but you mention fluoride varnish to repair the grooves; is that something that can be bought over the counter? 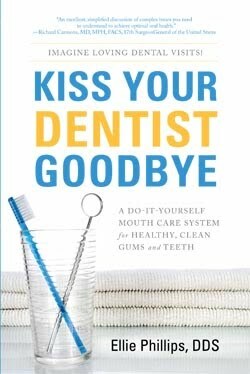 This book has been a life work part of it describes my journey into dentistry and the unusual path I walked as a dentist. I would really appreciate if you had time to put a review on Amazon it helps others sort out overpriced garbage books from the ones that can help. I would very much appreciate this. As for the apple simply eat some xylitol/Zellies after the fruit it immediately takes away the acidity and will return minerals to your teeth. Wishing you a healthy 2010! I don't have any way to tell you the exact mechanism.I know that this works for people who have very acidic mouths – and stops their damage.It also works to stop teeth being stained in the case of wine drinkers etc. Dear Dr. EllieI have been following your program for about a year. My dentist said my teeth are great as a result. Thank you. However, I have recently been reading Jerry Tennant, MD, who says that fluoride is bad because it aggressively pushes out the iodine we need, resulting in iodine deficiency, leading to hypothyroidism and other problems. So I am concerned about the ACT anti-cavity fluoride rinse. Please comment. Thank you.